Today, we don’t ask what our plugin can do for you, we ask what you can do for it: We are looking for a freelance developer to join our team! You, our great user community, are already helping us with the roadmap for future updates. 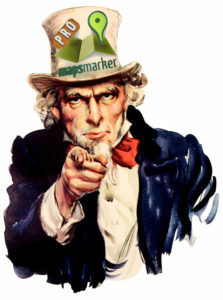 Now we’re asking whether you would like to work on it, too: If you are a Maps Maker Pro / Leaflet Maps Marker user, have the matching skills and already have an idea how you would like to improve the plugin, we’d be happy to hear from you! Maps Marker Pro is a WordPress mapping plugin. Our main goal is to provide our users with an intuitive and user-friendly interface for organizing and sharing spots and tracks. The plugin is based on the famous leaflet.js library managed by Vladimir Agafonkin, which also powers maps on sites like Facebook, Flickr, Foursquare, Craigslist, Wikipedia and Washington Post. We use this library as the basis for our plugin and have integrated several other leaflet plugins for enhancing its functionality. We are constantly improving our plugin: We frequently release updates and focus on high quality service and support for our users. As a freelancer, you will be working from wherever you want and provide your own equipment. You will be paid by the hour, with bonus payments for bigger and time-sensitive tasks. Moral code: We make sure that Maps Marker Pro doesn’t only work well, but that how it works is compliant with best practices for ethical coding. So, if you care about issues like privacy, encryption and open data, you will fit right in with us! So, if that sounds like something you want to do, please send your application to info@mapsmarker.com. Please make sure to include your hourly rate and your ideas for Maps Marker Pro: If it were up to you, how would you improve the plugin? Which feature do you think we should work on next?